but, filling up our punch cards and having them yell out “free meal” makes it so much more fun. 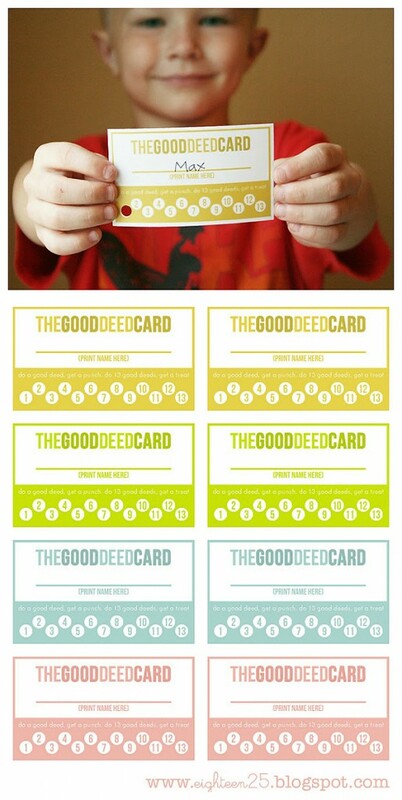 we thought it would be good to make some punch cards for the kids. hoping they will get excited every time they get their card punched for doing a good deed. eventually earning themselves a special treat. a little bribery never hurt anyone, right?? great idea-i could use this right about this time of summer vacation 🙂 thanks for the sharing the printable! Oh, I'm loving this idea, just fabulous! I think I need to whip these out today for my kiddos! Thanks! That is such a fun idea! Thanks for sharing! Brilliant! I'm printing these out of my grandkids. I mean who doesn't need a little incentive to be nice in this hot weather! Great idea! Thanks for sharing! Good grief you ladies are genius! This is JUST what I've been needing. Thanks so much for sharing the printable! Love this idea! Can I use one for myself to earn rewards too? Sharing with my FB fans! Love you guys! What a great idea!!! I love this. I think I am going to use them in a notebook I am making.Thank you for sharing. Thanks for sharing this great idea! I am going to try it out on my boys and if it works well I may even give it a try with my students. LOVE this! Thanks so much! I love it! What a great idea! This is a fabulous idea!!!! I had to pin it on Pinterest, I loved it so much! Very good ideas! You win a punch! This is the best idea, ever…I'm printing these as we speak (well, as I write anyway…;)) – just awesome – thank you so much for sharing them! what a really cute idea. i can't wait to use this when my daughter is a bit older. i just loooove this! 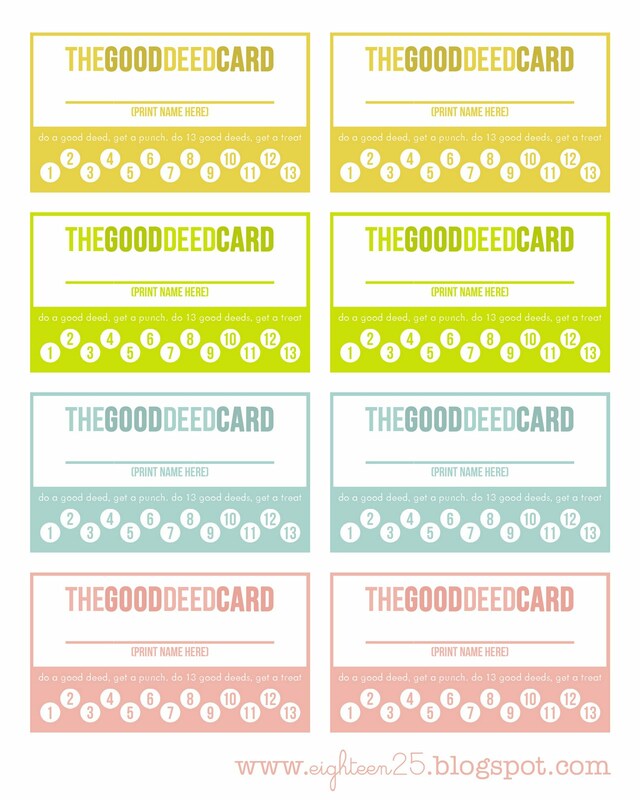 our little reward chart isn't working so well, i think i will give this a try! thanks! This is perfect, I was going to do something like this for my own kids. I want to teach them about doing nice things and helping out around the house… what a great approach to an award system. Just when I did not think your ideas could get any better you came up with this one. My daughter is going to love it. Hopefully she will have a clean room & a punch in the near future. Thanks. What a neat idea! Thank you so much for sharing. Thanks for posting this! I'm new to your site and think it is so cute! Anyway, I printed these out and I gave them to the kids tonight to go with our FHE on service. Such a cute idea! This is so cool! pinning! Such a fantastic idea! Thanks for the share. Much appreciated. Fantastic idea! Thank you for sharing with us. Thank you so much for this post. I want to let you know that I posted a link to your blog in CBH Digital Scrapbooking Freebies, under the Page 4 post on Jul. 26, 2011. Thanks again. What a genius idea. Thanks so much for sharing it!! I can use this for both of my little ones! This is sooooo adorable! I love this idea and I can just picture little hands pulling these out of little purses and wallets to get their punch!! Too Cute! Thanks for sharing! I love these and shared them on my blog! Oh I love this, I just wish I'd found them earlier. This just might help make the last few weeks of summer a little more peaceful. This is SUCH a great idea ~ not only for my jr high age kids but the little ones. I plan to print these out for mine but will also be suggesting these to my teacher friends. I LOVE THIS!!! I could use them in my classroom, too! Thanks!! LOVE these! Thanks so much! You guys are AWESOME! Thanks for helping make each of our lives a little more fun and a little more doable! 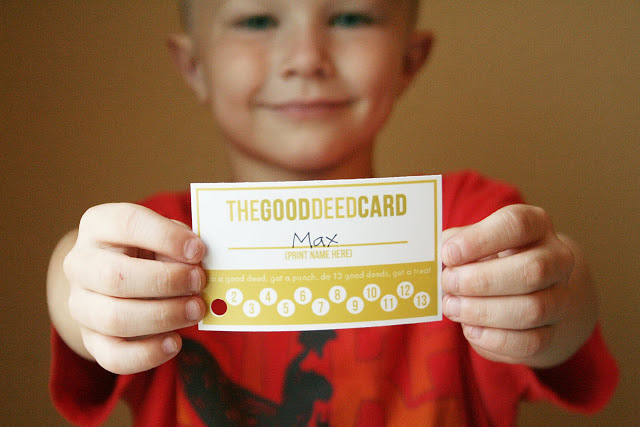 found your good deed punch cards on pinterest. what a wonderful idea. thanks for the download! Oh I love these — thanks so much for sharing them with all of us!!! I loved this ideas so much I featured you on Over the Big Moon today! What an amazing idea! Thank you so much!!! Hello, My name is Amy Greenberg and I am the co-founder of a website called The Grandparents Guide ( http://www.thegrandparentsguide.com). 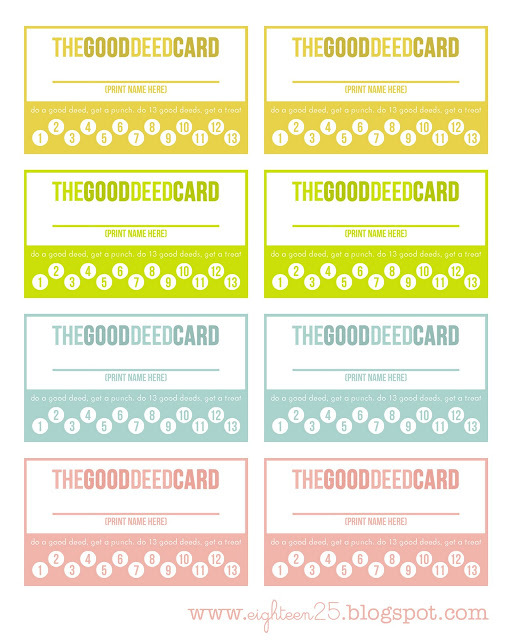 I would like to feature the good deed cards on my website. We are doing a week on manners and etiquette. We would provide a direct link to your site. Please contact me at amy@thegrandparentsguide.com if you are interested in partnering in this way. Saw on pinterest and making them right now for my 4 kids. Great motivation to do something without being asked! I love these, thanks for sharing. I have been putting off making my own. I am so thankful I found these! I'm going to use this idea with my little sister, mouahaha! Thanks you a lot I'm so thankful I found this idea! Get our latest & greatest posts straight to your inbox.